The Fates brought me to Pam Anderson, cookbook author and person extraordinaire. Thank you, Fates. It started a few months ago when calamity struck Erika of Ivory Hut, a fellow food blogger and member of Kulinarya, a group focused on Filipino cooking. Erika's house burned down to the ground; in an instant, her home and all her family's belongings were gone in smoke and ash. My eyes still tear up thinking about it. I found out through other Kulinarya food bloggers that threemanycooks.com had set up a donation site. I went to the site to donate and saw that threemanycooks is the trio of Pam Anderson and her daughters. I've known Pam Anderson through her writing for almost twenty years. As a fledging foodie in my twenties, I subscribed to Cook's Magazine and then to the launch of the new Cook's Illustrated Magazine and then the new Fine Cooking Magazine. A loyal reader, I've noticed, noted, and respected Pam's work. Not only was I deeply moved by her and her daughters' efforts to help Erika -- they raised $10,000 -- I was thrilled to find Pam online. It was like finding on old friend. Then a month ago, my school's Parents' Association asked me to do a presentation on cookbooks at the local Barnes & Noble as part of a fundraiser. When I went to the Barnes & Noble to meet with Sally to go over my cookbook selections, I picked my favorites like Thomas Keller's Bouchon and Ad Hoc at Home, David Chang's Momofuku (which I actually don't own but have read (hint, hint, family, Christmas gift alert! )), and Andy Pforzheimer's Barcelona Cookbook, which features recipes from the outstanding Barcelona Wine Bar restaurants. I also wanted to feature some food blogger cookbooks, so I asked Sally to order copies of Jaden Hair's Steamy Kitchen Cookbook, Ree Drummond's Pioneer Woman Cooks, and Bakerella's Cake Pops. 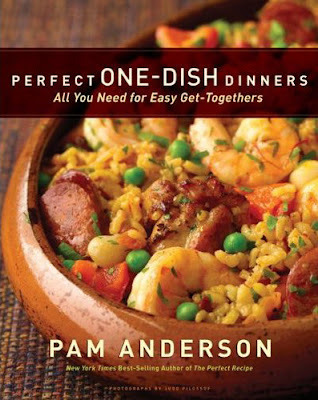 As we stood lingering by the cookbook promotions table near the front of the store, Sally picked up Perfect One-Dish Dinners and said, "Have you seen Pam Anderson's new cookbook? She's lives locally." Pan Anderson lives nearby? Serendipity. And yes, I wanted to feature Perfect One-Dish Dinners. A couple days later, my friend Julia Facebooked me with a message: "Hey--speaker next Tuesday at the library, Perfect One-Dish Dinners. I just registered. Thought I'd check to see if you were interested. The reviews are really good." At the library, I finally got to meet Pam. Sitting back with glasses of wine and tasting her delicious sausage and white bean casserole from her book, Julia and I listened to Pam's down-to-earth and genuine approach to food. Her sentiments deeply resonated with me, and again, I had that feeling of listening to a dear friend. She said her books reflect the journey of her life, as does my blog. She said entertaining shouldn't be hard and that it's not really about the food, but about bringing people together. Ain't that the truth. She said people confessed to her they were intimidated when she was coming over for dinner; she confessed to us, how do they think she feels when they come over her house? I know the feeling, and I'm not even a cookbook author -- just a hack who other people now think is some amazing cook. She said she focused one of her cookbooks on losing weight, because she realized she was using food for other reasons. I can relate to that big time. This woman is real. Don't you love Pam Anderson, too? After her talk, I told her I was featuring her cookbook and would she come sign some of her cookbooks? Although she didn't know me or know my cause, she didn't hesitate to say yes. And then she went to the bookstore the next day and signed 20 cookbooks. Perfect One Dish Dinners is a must buy. The recipes are easy, accessible and elegant at the same time. For entertaining, any of these dishes and their suggested appetizers and desserts are a snap. Pam's techniques are foolproof. For all these reasons, you should buy her book. But what's important to me and why I bought her book is that she's a nice person. Knowing that, I know her recipes are infused with her generous and kind spirit. That's the best ingredient of all. When I got home, I made her cassoulet, adding in some fennel since I had some in the fridge. It took about 5 minutes to put the ingredients in the pan, and about 55 minutes to cook unattended. A neat trick Pam employed to brown the sausages in the oven was to put the roasting pan on the lowest rack. Worked like a charm. A wonderful and easy supper for any night. Also a great dish to do for a tree-trimming or other party. To see Jaden Hair's post on TLC regarding Pam, who she fondly called her "virtual kitchen mentor," and featuring this recipe and others, go here. If there’s time, sprinkle buttered bread crumbs over each plated portion for a nice touch. Heat a medium skillet over medium-low heat. Toss 2 cups fresh bread crumbs (made in the food processor from a good European-style loaf) with 2 tablespoons melted butter and a light sprinkling of salt. Add the crumbs to the skillet and cook, stirring frequently, until golden brown, about 15 minutes. Stored in the refrigerator and warmed on the stovetop or in the microwave, this dish means instant dinner later in the week. Mix sausages, tomatoes, onion, garlic, olive oil, vinegar, thyme, bay leaves, and a generous sprinkling of salt and pepper in a large heavy roasting pan. Set pan in oven and roast until sausages are brown and tomatoes have reduced to a thick sauce, about 45 minutes. Remove from oven, stir in beans, and continue to cook until casserole has heated through, about 10 minutes longer. Serve. Silly me - I thought you mean Pam Anderson the actress! Well, whoever the recipe comes from - looks fantastic. I just came from a sausage making course this weekend... have a bunch of Italian sausages ready to be used... for sure this recipe will come in handy. Gorgeous! I have some white beans just waiting to be used....I think I may try this one out. I've seen this cookbook mentioned on a few sites, but have yet to pick up a copy. And Pam Anderson does sound very real. As far as using food for other reasons, I can relate to that too. And the cassoulet looks delicious! what a beautiful plate of food! Ive heard so much about this book, i will most definitely ask for it for Christmas. Cooking sausages is such a blessing in the kitchen! It's all there... the taste, meat, serving all wrapped neatly! And they're absolutely delicious too! Your photos of this recipe are unbelievably delicious! Would love to post them on www.canigettherecipe.com with full links and credits to you. Please let me know if you are keen! I made this and it was very good; the sauce did not thicken up. I did not cover the roasting pan. Should have I covered it? No, don't cover the pan as your sauce would be even more watier in that case. I think it's ok if the sauce doesn't thicken up.